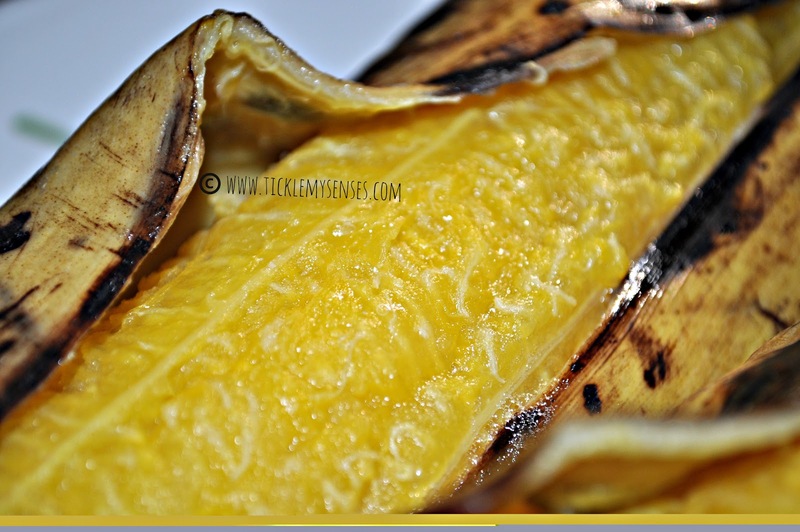 Tickle My Senses: Steamed Bananas, Steamed Nendran Bananas. I have been craving Steamed Banana for a while, not just any Steamed Banana but one made using the ripened 'Nendra/ Nendran Banana', 'Nendra Baale' in Kannada, 'Nandarkai' in Mangalore Konkani, 'Moirachi Keli or Maidyachi Keli' in Goan Konkani and 'Nendran Pazham' in Kerala. Unfortunately I had to wait for several weeks before I managed to spot it at our local Asian stores. Nendran Bananas are a variety of banana, much bigger in size than the regular Cavendish, flesh is firmer, silkier and sweeter. When raw they are used to make Savoury Banana Crisps or Chips or 'Pathekaan' in Konkani. On ripening their skin gets darker spots or patches, their flesh turns sweeter lends itself wonderfully to cooking, unlike most bananas that leech out liquid on cooking. Like my mom would, I filled a 'thondoor' or Mangalorean steamer with water. Let the water come to a boil, placed the bananas on a metal sieve at the centre of the steamer and let it cook for around 20 mins or till well done. While still warm I served it alongside my favourite 'Mangalorean theek poh/ Spicy beaten rice'. It was heavenly, delicious, moist, sweet, silken and full of flavour. Baby A enjoyed slices of the uncooked banana caramelised on a shallow frying pan with salted butter and a good sprinkling of sugar and powdered cinnamon. However you choose to eat bananas, do have them, for they are packed with vital nutrients known for preventing tummy ulcers, its potassium content may help prevent the formation of kidney stones and protect against high blood pressure and stroke, the vitamins in bananas (particularly vitamins A, C, and E) can help protect your eyesight. The tryptophan in bananas can help increase levels of serotonin in the brain, giving you a mood lift. The vitamin B6 in bananas can help regulate blood glucose levels. 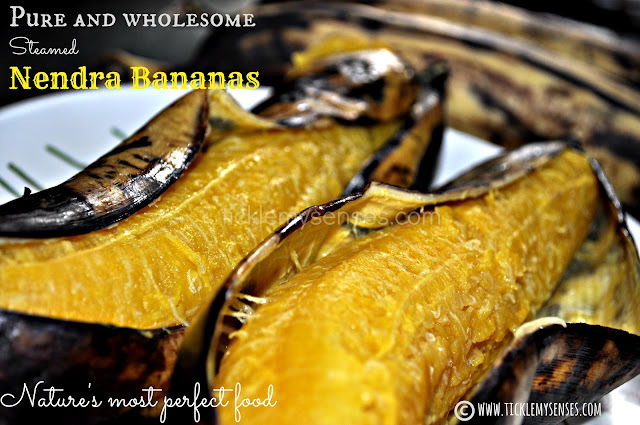 Bananas support health and beauty, give you energy, and they taste great. So make them a part of your diet. 1. Place the whole unpeeled Nendra Banana in a rack in hot steamer or thondoor. Steam for 2o- 25 minutes or till done. Serve while still warm on its own or with Spicy Beaten rice for breakfast or as a tea time snack. 1. Peel the uncooked banana. Slice into 1/2 inch circles. 2. Heat a wide-bottomed frying pan, melt the butter, and when it starts to bubble add the banana slices. Sprinkle with sugar and fry for a minute before turning. 3. Continue frying on a medium heat until the sugar has started to caramelise and the bananas are golden brown. Sprinkle over a pinch of cinnamon. Take off heat. Serve just as it is as a tea time snack or with yoghurt or a scoop of vanilla iccream for dessert. 2. Saying 'I Love you Mother' with "Baked Banana Donuts with Dark Chocolate Chips"
3. Australian Fresh Pineapple and Banana Cake with a Cheese and Buttercream Frosting and Happy Birthday Hubby. 4. Avocado, Banana and Apricot Cake/ Muffins with a Chocolate Avocado frosting. 5. Mangalore Style Spicy Plantains with Dried Shrimp, Kele Sukke with Galmbi. 6. 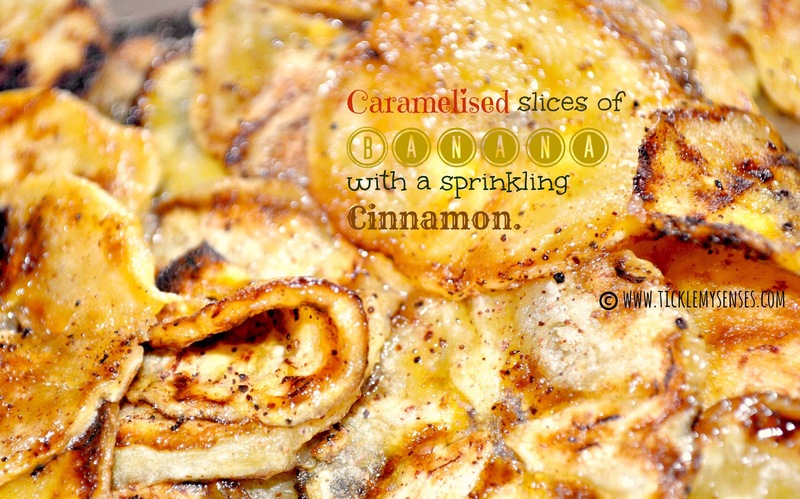 Heera's Ghariyo- Sweet Banana Fritters. If you enjoyed this post or any other, share it with your friends, and please drop me a line in the comments box at the end of this post, or on my Facebook page or at carol@ticklemysenses.com, would love to hear from you. awesome recipe.. will try it at home.. my mom loves sweet dishes.. so i was searching for simple sweet dishes online anyway.. will make the caramelized one for women's day! Yummy.. I am going to try out the nendra pazham ghee roast now ..
Mangalore Style- Spicy Beaten Rice/ Theek Pou.